After a restless night’s sleep, I unzipped my tent and peeked out to see a beautiful day. It took a while before my muscles would react enough to stand up and walk. After a breakfast of rehydrated biscuits and gravy, I was ready to do some exploring. The first place I wanted to go was Phantom Ranch. I expected it to be some distance away, but it was only a short walk from our campgrounds. 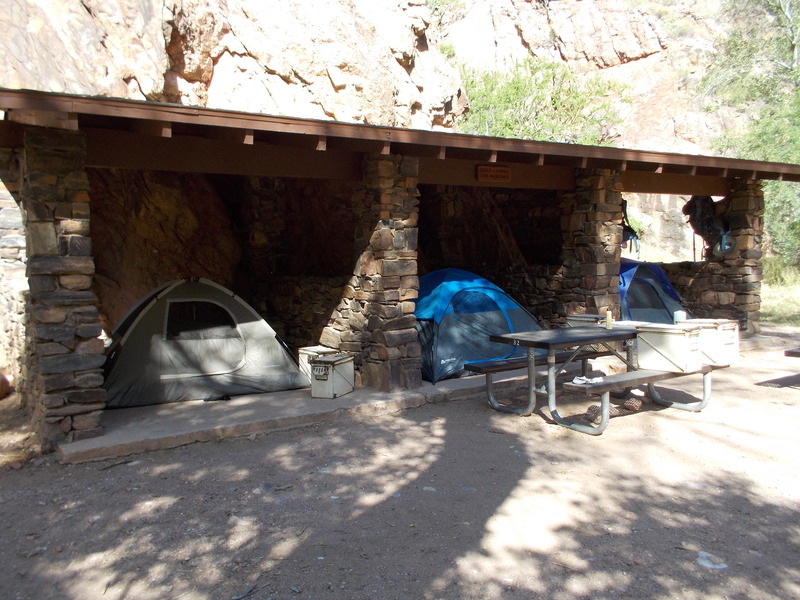 Phantom Ranch is a collection of small cabins and a bunkhouse with beds that can be rented by hikers. We headed for the canteen, which is open to the public, so to speak. I was delighted to discover that I could buy a lemonade with all the ice I wanted. This was especially enjoyable after a day of drinking tepid water. The rest of my party was excited about the fact that the canteen sells Bright Angel IPA–a beer that can only be purchased there. This would necessitate another trip to the canteen in the afternoon. Returning to the campsite, Mike checked on the beer and wine he had left cooling in the creek. 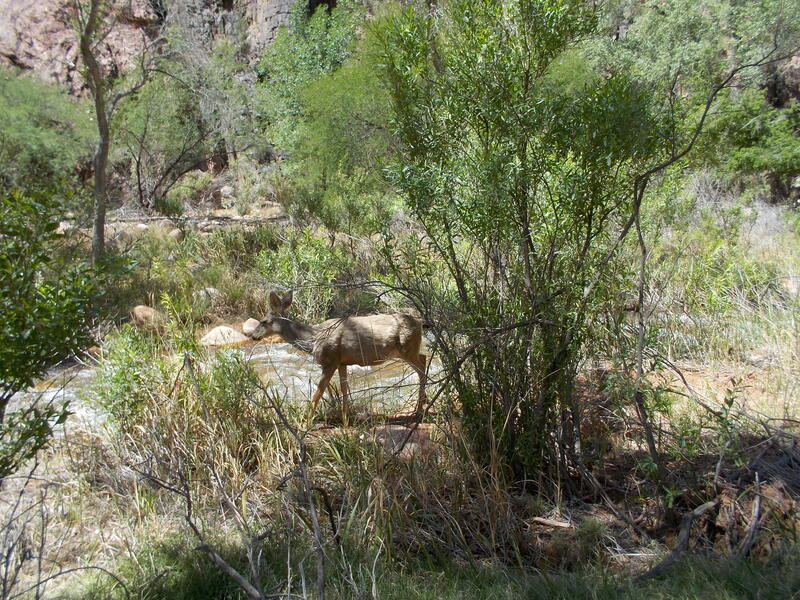 Then we decided to explore Bright Angel Creek to the place where it flows into the Colorado River. The water was cool and refreshing on such a warm day and we couldn’t resist getting into the creek. 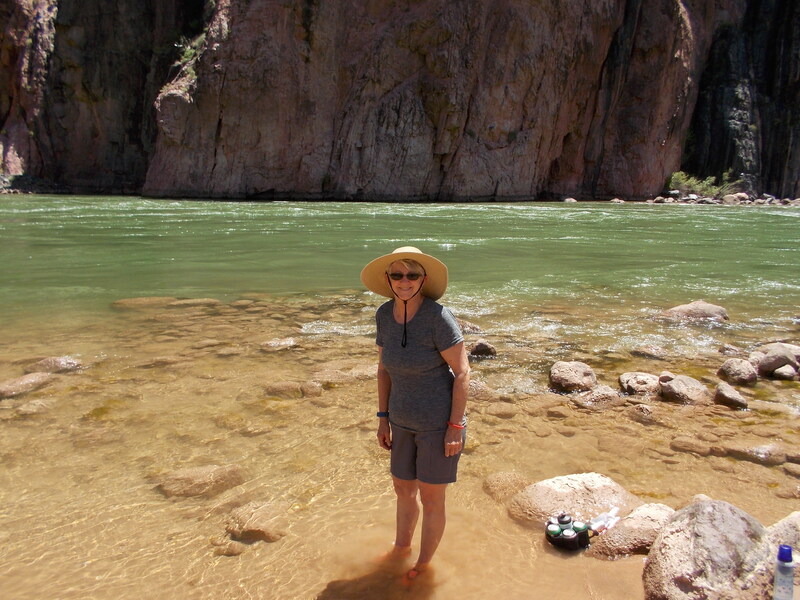 Swimming in the Colorado River is dangerous due to strong currents, but we did find a sort of inlet where we could wade in the river. After lunch (rehydrated mac and cheese) I decided it was time for a nap. After all, I needed my rest for the climb out. 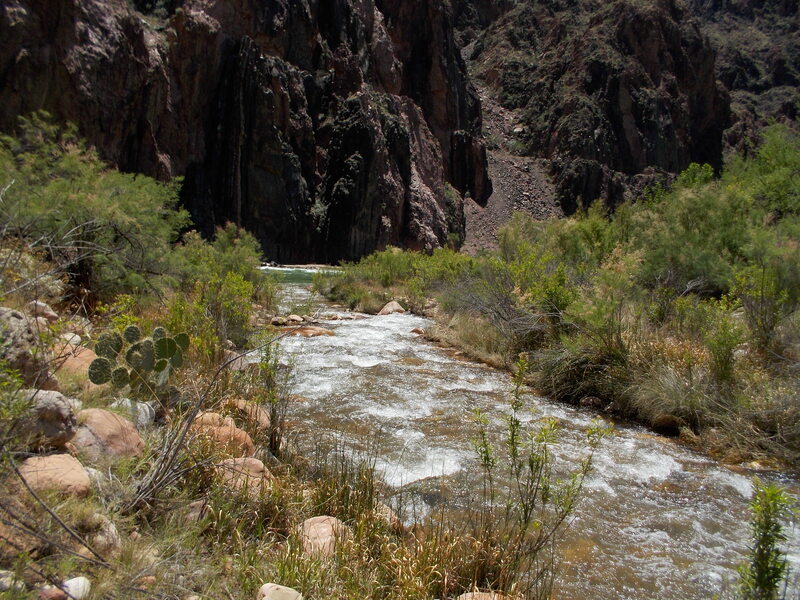 It was while I was resting that I devised my plan to get out of the Canyon on my own power. I knew that it was the heat that made it so difficult for me to keep going on the hike in. If I could leave very early in the morning, I could hike while it was cool and get a good head start before the heat set in. My plan was to leave at four o’clock and to reach Indian Gardens by eight-thirty. In the afternoon, Mike took me on a hike to see Black Bridge. It is an engineering wonder, held in place by huge cables that are embedded in solid rock. There are eight cables and two wind cables. 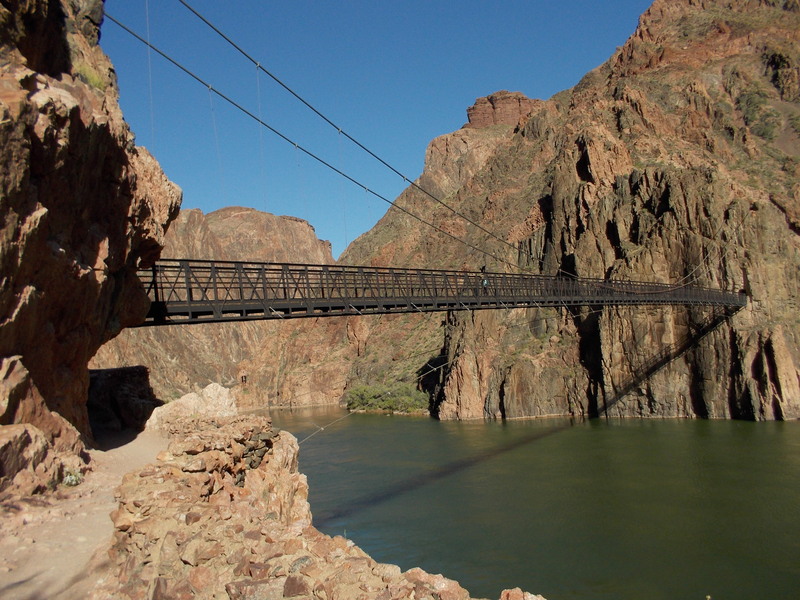 To get a cable into the Canyon required forty-two Havasupai men to carry them down the South Kaibab Trail. We walked across the bridge and through the tunnel on the other side. 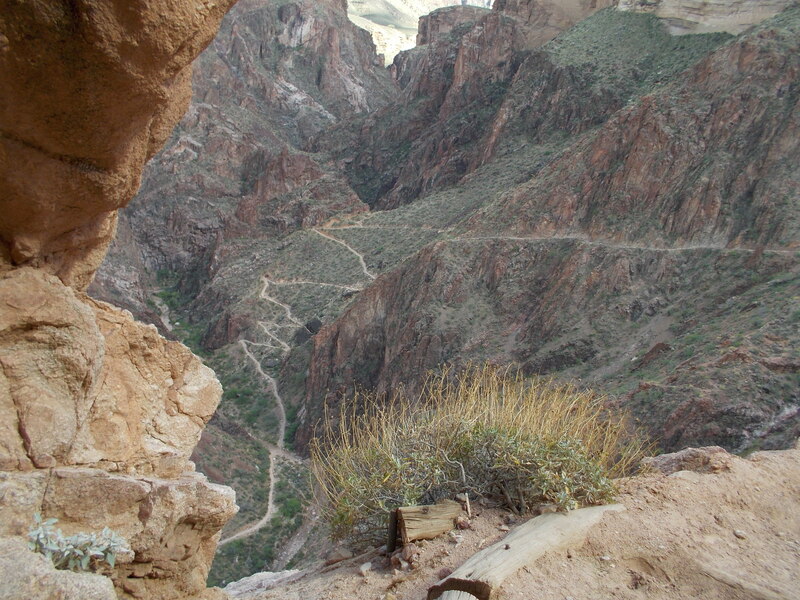 From there I could look up at the South Kaibab Trail, the trail I attempted to go down the year before. On our way back to camp, we passed by some Indian ruins of the Pueblo People. 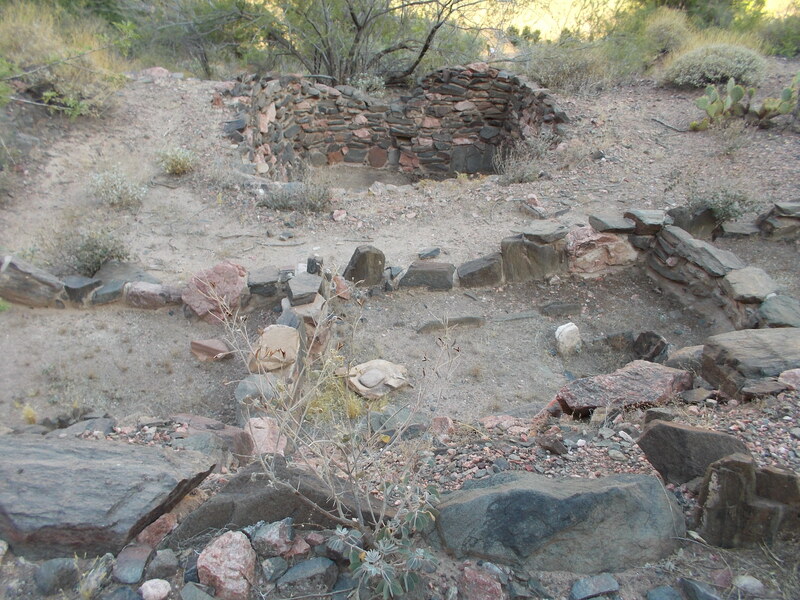 There are several residences and a kiva. 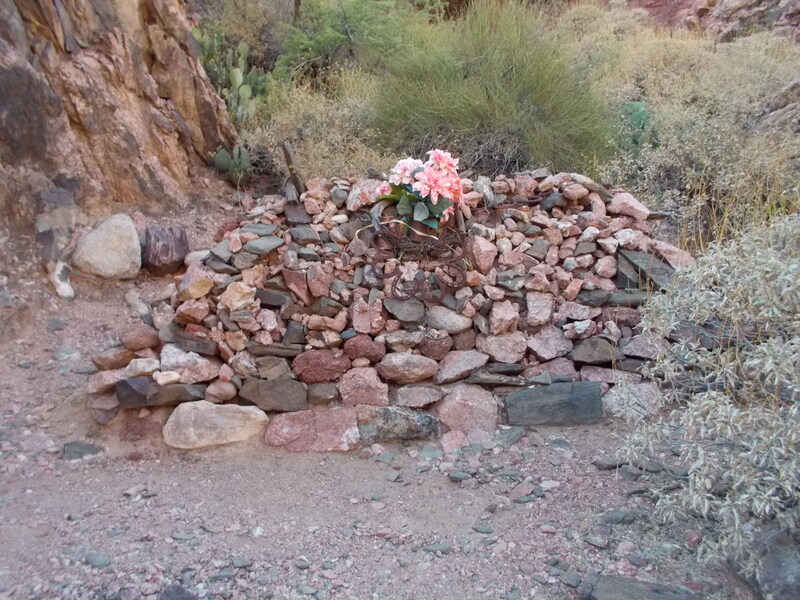 There was also the grave of Rees Griffiths, a trail foreman who died from injuries he received while working on the Kaibab Trail. After dinner, we were visited by the ranger, a friendly woman with quite a sense of humor. When she learned of my difficulties hiking in, she pointed to Mike and asked, “Is that your son, your natural son, that you gave birth to?” When I assured he was, she told him that since the next day was Mother’s Day, as a gift, he should carry something from my pack. After some consideration, I decided to leave my sleeping mat for him to carry, thus lightening my load by about four pounds. As darkness settled in, I crawled into my sleeping bag and wondered if I would be able to sleep, knowing what tomorrow would bring. Would my plan work? Would I reach Indian Gardens on my own power? 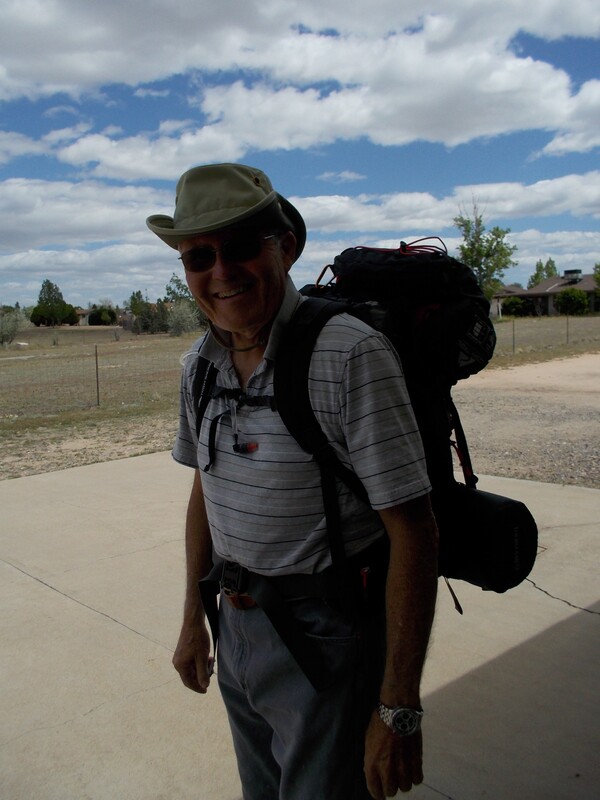 Those of you who read my blog may recall that last year I attempted my first backpacking trip into the Grand Canyon. That trip came to an abrupt halt when my husband, Craig, ran into difficulties. It was obvious that he was not capable of such a demanding trek. A year later, I was attempting it again without Craig. This time I would have to prove myself capable. If I turned around and gave up, it would be because I couldn’t make it. Our party was pretty much the same as last year–My son, Mike and his wife, Vikki, her brother, Bill, and his wife, Katie, Mike’s son, Christopher, and Vikki’s son, Chris. 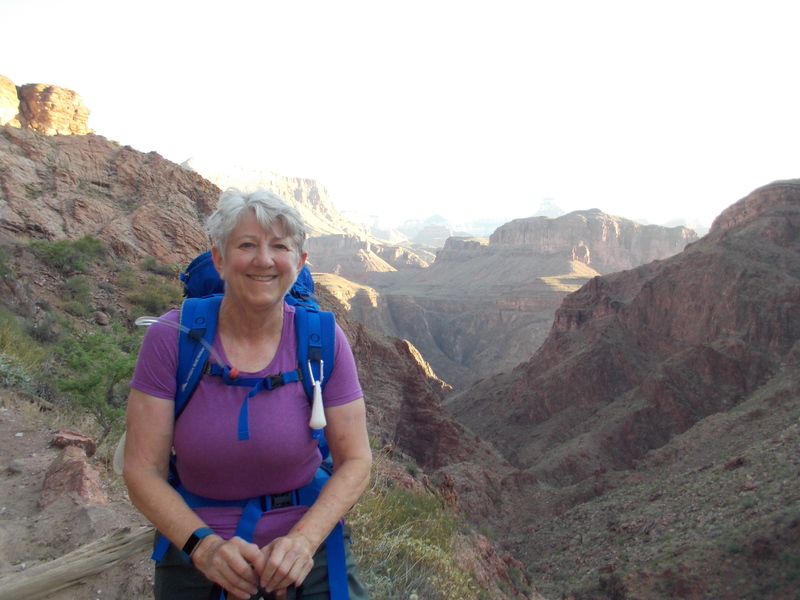 Instead of going down the South Kaibab as we did last year, we used the Bright Angel Trail in and out. It is about three miles longer, but less steep. We extended our trip to four days and split our exit into two parts–allowing one night at Indian Gardens, before the four-and-a-half-mile climb to the top. Hiking the nine-and-a-half miles in was the most difficult for me, and the main reason was the heat. I was hoping for an early start, but it was after eight o’clock when we began our descent. I reached Indian Gardens at about one o’clock, and was already feeling the affects of the temperature. I rested there for a while and began the last five miles at about one forty-five. At first the trail was fairly flat, although rocky and crossed the creek several times–That was until I reached something aptly named the Devil’s Corkscrew. I stood at the top for a long time, afraid to start down. I watched other hikers go down it, and tried to convince myself that I could do it. Finally, I started down, By that time, the heat was making it very difficult and there was no shade at all. I was stopping quite often, leaning against the side of the canyon to rest. I attempted to reach my son on the radio, but was not successful. It had been at least an hour since I had seen another human being and I was getting a little concerned about my ability to finish the hike. Just before I reached the final switchbacks, I abandoned my pack in an effort to get close enough to reach someone on the radio. At last I did and learned that my grandsons were on their way back to help me with my pack. I reached the Bright Angel Campgrounds before dark. Too tired to eat dinner, I crawled into my tent and slept. I’m sure I was suffering from some dehydration as my legs were cramping. Chris, who carried my pack the last few miles, was throwing up from exhaustion. But we were all safely at the camp. Tomorrow would be a day to rest and explore the canyon. 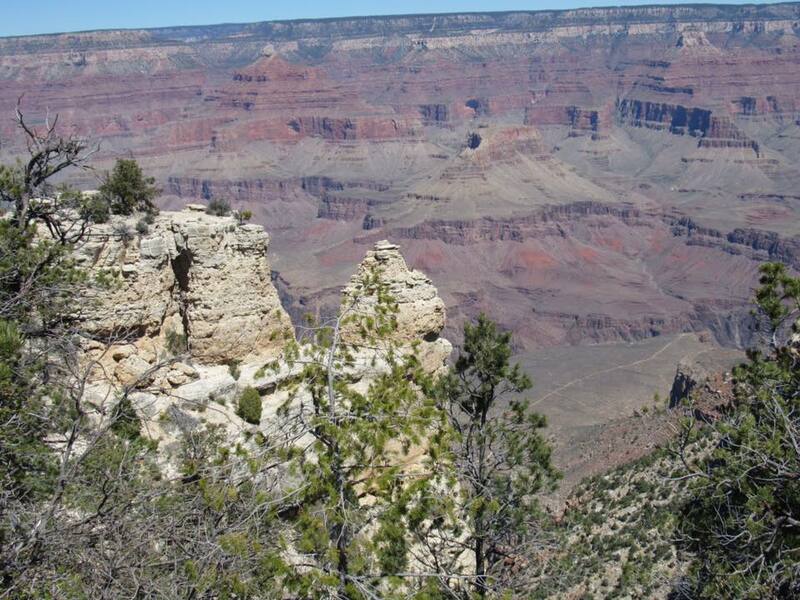 Then I would have to face the next two days’ climb to reach the rim. Could I make it? I had my doubts, but I needed to do my best to make it on my own–not putting anyone else’s health at risk.